This article is about the ship. For the quest, see The Dainty Sload. The Dainty Sload is a ship currently docked for supplies. It is found northeast of Solitude and southwest of Solitude Lighthouse. The ship has one interior zone: the Dainty Sload. The Dainty Sload's topside deck is guarded by two corsairs: one sits or stands looking out to sea, while another roams the deck. If you wish to avoid them, wait until the roaming corsair disappears behind the cabin and slip through the unlocked door. There are numerous sacks and barrels on-deck containing a mixture of ingredients and foodstuffs. You can also find a woodcutter's axe and to the right of the entrance to the cabin there are two bottles of skooma on top of a crate. Against the port-side railing are two open crates; one contains five giant lichen and the other several cabbages. On shore by the start of the jetty is a deathbell bush and two patches of spiky grass. 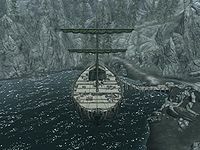 If your Sneak skill is fairly high, then it is a quite easy to slip past all of the corsairs that wait below-decks. To the right of the entrance is a rare fur helmet and set of fur armor on a sideboard and crate. Next to this is a cupboard with a knapsack, a woodcutter's axe and iron mace on the shelves, and an unlocked chest. Turning around at the bottom of the stairs, you will find a kitchen of sorts on the left with quite a few items of food in barrels and open crates. One of the open crates contains a gourd, fly amanita and a rock warbler egg, while the other contains bread and cheese. There is a table and chairs where two corsairs sit. Behind them is a cupboard with an iron helmet on the shelf and a sideboard beside the table with a salt pile, a bottle of alto wine and a common book on top. Following the linear passage, there is an open door with a random weapon on the floor to the left. Through the door and past another table with bread, cheese and a tomato on top, and behind among a stack of crates is a lute. You will come to a room on the left with a sleeping corsair inside who will wake shortly after the door is opened. In this room is an unowned single bed, an end table with a set of clothes on top and a pair of boots beside it, and a sideboard with three bulbs of garlic, a gourd, a bunch of tundra cotton and a single loose septim on top. Past this room is a set of shelves holding several small mead barrels, two bottles of Nord mead, and a bottle of wine. Following the passage to the waterlogged bowels of the ship brings you to the last corsair on board. Under the stairs just descended is an unlocked chest, and to the right of the room are two garlic braids and a bunch of dried frost mirriam. Opposite these, on top of a barrel is a pickaxe. Through the door at the far end is a set of shelves straight ahead, holding a draught of strength, a potion of health, a potion of regeneration, two bunches of lavender, and a common book. To the left is an adept-locked chest. On top of the end table in the corner to the right is another fur helmet and fur shoes. Follow the passage all the way to the end to face the first mate, who will be found sitting at a table facing away from you. On the table is an unusual gem, a random poison, a bottle of alto wine, two empty wine bottles, a deathbell flower, three copies of The Firmament, a plate of horker loaf and a green apple, a loaf of bread and a copy of the Speech skill book A Dance in Fire, v6. Just before the first mate, there is another unowned bed on the right and end table opposite with a set of fine clothes on top and a pair of fine boots beside the bed. The captain's chest can be unlocked with the Dainty Sload footlocker key, which is carried by the first mate. Backtrack to the captain's chest. If you are here during the related quest the captain's chest is where you need to place the Balmora Blue. Beside this a cupboard with fur bracers, a food sack, a deathbell flower, a basket containing a bunch of tundra cotton, five common books and an empty strongbox on the shelves, with another pair of fur shoes on the floor beside it. Continue backtracking to a dining table laid with fine crockery, holding two seared slaughterfish steaks, three salmon steaks, two bottles of alto wine, a baked potato, bread and cheese, a bunch of tundra cotton and a potion of regeneration. On the other side of the rocks by the plants is an iron ore vein. If the corsairs and the first mate have been killed prior to the quest The Dainty Sload, the ship will fully reset, giving you a chance to double your loot. The corsairs may carry scimitars, which are otherwise quite difficult to find.